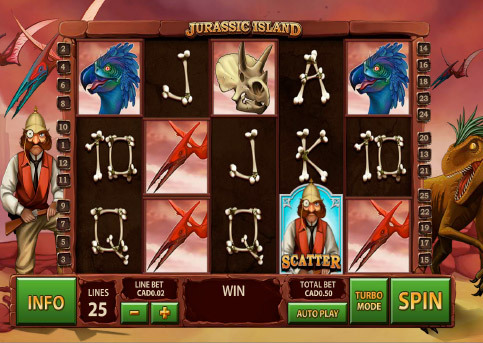 Jurassic Island at Fly Casino is the latest game added to our extensive line of slots. This 25-line game comes with amazing graphics, sounds and is packed with great bonus features including a new and very cool concept – A SKILL-BASED BONUS ROUND! Hot Shot Hunter Bonus feature is a skill-based bonus round. Dinosaurs will rush across the screen while you try to target them into your sights, and each of them gives you a cash prize between 1 and 10 times your bet. Multiplier Free Games feature, 2, 3, 4 or 5 scatters will give you 10, 15 or 30 multiplier free spins. Carnivore Free Games feature, 3, 4 or 5 scatters will give you 10, 15 or 30 free spins. Landing 2, 3, 4 or 5 scatters will retrigger the feature giving you 3, 10, 15 or 30 additional free spins respectively. Raptor Free Games feature 3, 4 or 5 scatters will give you 16, 24 or 40 raptor free spins. Spinning 2, 3, 4 or 5 scatters will retrigger the feature giving you 3, 16, 24 or 40 additional free spins respectively. 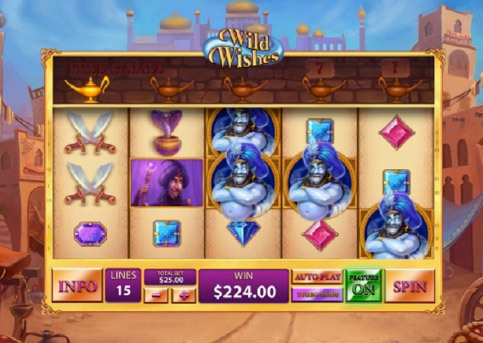 Fly Casino is pleased to release Wild Wishes online slot. It is the latest game added to our just released slots section. This 15-line game with an extra bet feature comes with an incredible amount of re-spins! There are five lamps above the reels on the left-hand side of the game. When you get a winning spin, the leftmost lamp will light-up and you will receive 1 free re-spin. If you hit another win on the next spin, the next lamp will light up and award 1 more free spin; if you get 4 wins in a row you will be awarded 7 free spins – 5 wins in a row will award up to 50 spins! Pressing the ‘Feature’ button below the reels will cost an extra 40% of your bet but it will keep the first lamp lit, meaning that fewer winning spins are needed to trigger the free spins. 120% up to $120.00! From 00:00GMT until 23:59 GMT, all members are invited to receive a 120% bonus up to £/€/$120.00 bonus on your deposits £/€/$30 or more made. $30 for $30 X 5! From 00:00GMT until 23:59 GMT, all members are invited to receive a $/£/€30 bonus on your deposits of $/£/€30 or more. Claim it 5X! GET $150.00 TODAY! From 00:00GMT until 23:59 GMT, all members are invited to receive a 100% bonus up to 150.00 on your deposits of $/£/€50 or more.